Colin-from-Ayr and his friend George joined us after breakfast, and we rode the short distance to Gourock to catch our first ferry of the day, to Hunter's Quay. We shared the crossing with a van promising SAUSAGES PUDDINGS BURGERS PIES HAGGIS, which I almost photographed as being the most Scottish thing we were likely to see. Howard and I ascended to the top deck for our quarter-hour journey, pointing out jellyfish and cormorants to each other. The road skimmed along beside the sparkling loch, with friendly corners, long straights, and locals happy to warn of the police speed camera van with a flash of headlights. Howard zoomed ahead, to stop in a layby and take photos as the rest of us arrived; I waited for him before tucking in behind, and we had a enjoyably brisk ride catching up to the group just before Inverary. I was very smug about our passing a group of six bikes who didn't seem to know how to overtake, but took fright when they arrived in Inverary a few minutes behind us, and insisted we had to go to a different tea room. Luckily, there were plenty to choose from. 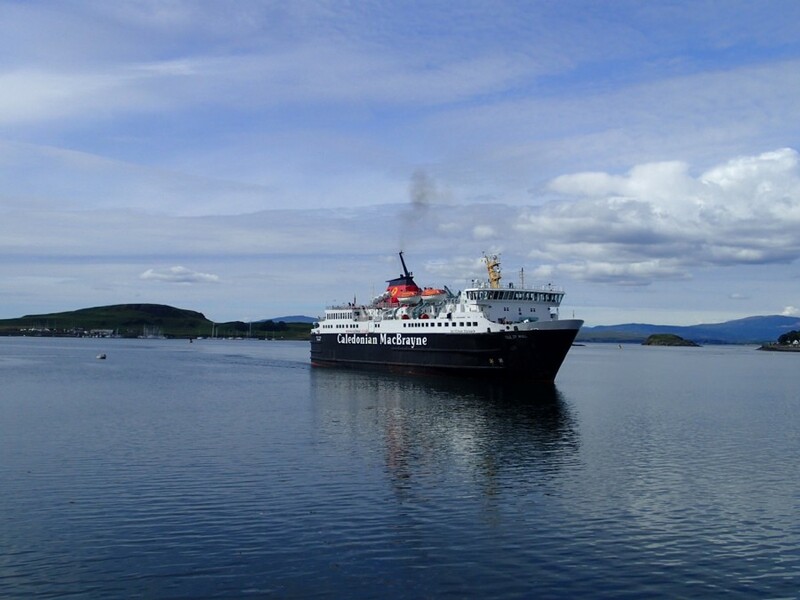 Dave had told us that the one appointment we absolutely had to make was the 2PM ferry from Oban to Mull, so naturally we missed it. Howard and I had gone on ahead, enjoying the open bends (I flattered myself that I'd got some good lean angles going on, and Howard kindly said they had looked very impressive in his mirror), then some almost continental mountain roads and scenery. I was paranoid that the others had somehow taken a faster route and sneaked on board without us, but they turned up a few minutes later. In the end it turned out not to matter; we had an hour to wander round Oban, and caught the 4 o'clock with no problems. 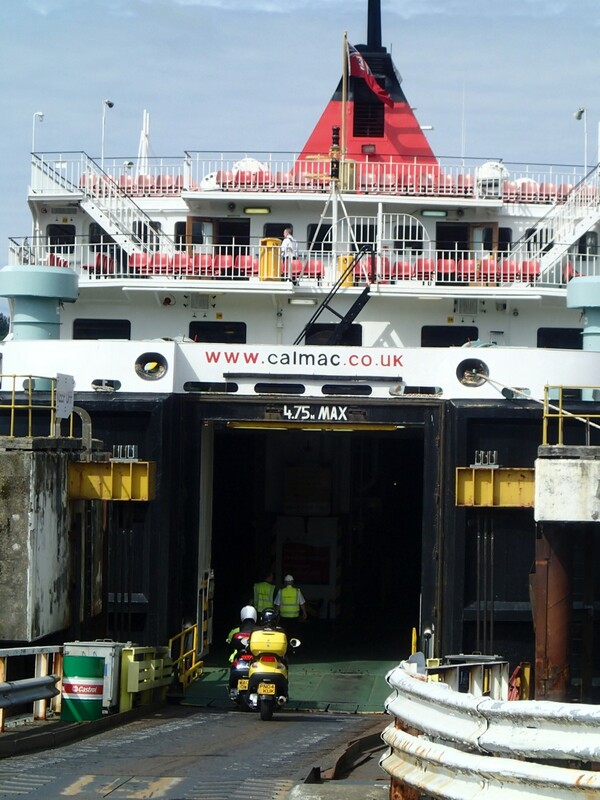 This was our longest ferry crossing, at 45 minutes, and much more like the Channel crossings I was used to, with bikes strapped down and no passengers allowed on the vehicle deck during the voyage. The ultra-efficient Dave had prepared a long, medium and short route, so we took the middle path, which turned out to be a winding single track with what would have been lovely views if we hadn't been busy looking out for gravel and sheep. Our B&B in Dervaig was quiet and out of the way, with bedrooms overlooking a tiny lake where otters, we were told, might be seen. It was also a couple of hundred yards from the local pub, where I enjoyed crab linguine and a local cheeseboard. Ice cream of the day: 'Tonka bean' (coffee and toffee) in Inverary. Agh! Between this and the bunny's adventures up north, I've got to get up thereabouts sometime. =:D It'll actually be my first time - thus far, I've not been further north than the Lake District and Hamburg. And I love the sound of crab linguine, given the quality of seafood available thereabouts - did it live up to the promise? I had hoped to eat some local seafood, and the crab did not disappoint. Best bit, though, was the homemade garlic bread! I've been to Scotland with my parents, but going on bikes was a very different experience. I have fond memories of a sunny afternoon on Mull. We climbed a little hill (just west of Tobermory) which has a lake on top. 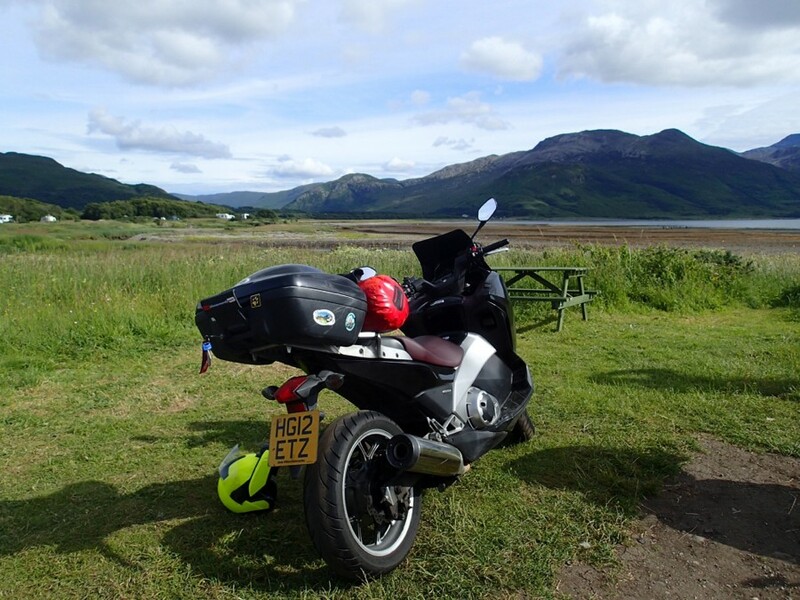 I have rather less fond memories of the rest of the five days (or so) we spent on Mull. It was wet, and foggy, and cold, with a side order of extra wet, and bonus fog and cold. And wet. I think it's the Rough Guide to that part of the world which includes the immortal line "Mull is the wettest of the Hebrides (and that's saying something)". Lovely place if it's sunny. Less so otherwise, as you discovered yourself. We were so, so lucky with this one - cloud and wet were due to descend the day we left! Inveraray is, to my mind, the quintessential good-weather south Highlands touristy pottering town, if that's even a thing. Also, it has Loch Fyne Whiskies, which can look intimidating from the outside but is actually very friendly, and has therefore had too much of my money over the years... I think I remember the "Tonka bean" name, so it's possible I've been to the same ice cream place. Can't be sure, though. Never actually been to Dervaig. I've seen signs to it, but that doesn't really count! Ha, I did not notice that cheeky detail of the signage! I think the first photo was taken from the ferry; it was a bit cloudy by the time we got to Inverary, though it cheered up again. I'd have liked more time in the town, though I did check out the Christmas shop. I really want to see Skye. Next time!